Lessons for beginner, intermediate & advanced levels. In the 2nd part, Paco Fernández invites us to acquire 2 complete compositions 'Sastipén Talí' (alegría) and 'La Fragua de mi Pare Curro' (seguiriya) of his latest CD Sastipén Talí. Paco demonstrates these techniques and compositions in practice and replays them slowly on a split screen with close ups of the left and right hands. The Flamenco Guitar Maestro Classes of the independent label ‘La Sonanta Productions', are created in close collaboration with the world’s best gypsy flamenco guitar maestros, who are the true treasure keepers of flamenco music. In these series, renowned flamenco guitar maestros reveal the secrets behind their flamenco guitar playing. 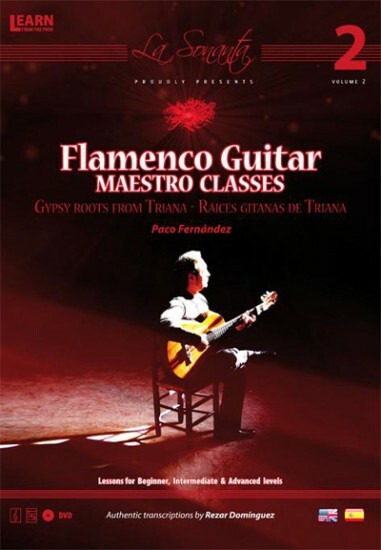 Starting from the basics of flamenco guitar technique, they use step-by-step exercises based on their own CD compositions. Following these clear lessons will enable you to reach the final level of the Flamenco Guitar Maestro Classes, playing along with the Maestros’ stage performance of the same compositions. 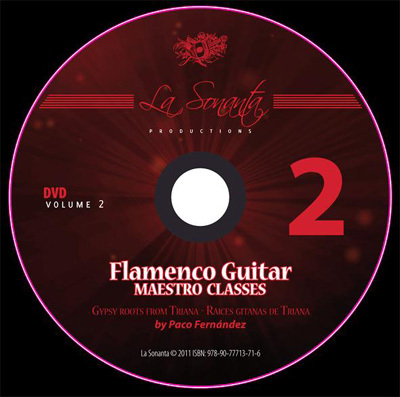 In this flamenco guitar DVD production, the maestro and composer Paco Fernandez invites us, not only to study his techniques and exercises, but also to acquire complete compositions of his latest CD Sastipen Tali, a fascinating balanced blend between traditional and modern flamenco guitar music. Sastipen Talí enables us all to discover flamenco in its purest form...going on a journey through different musical styles such as Indian, African, Andalusian rhythms and the unmistakable flamenco guitar sound of Paco Fernandez. • Intensive, long interviews with Paco Fernandez, his guitar maker and his family.